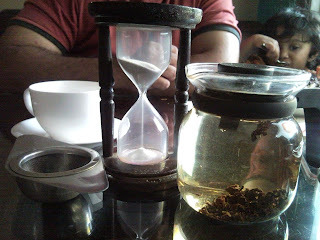 I visited Infinitea a long time ago, when the concept was first introduced in Bangalore. A place where tea and not coffee took precedence. And when I say tea, it is much much more than the milk and sugar variety. 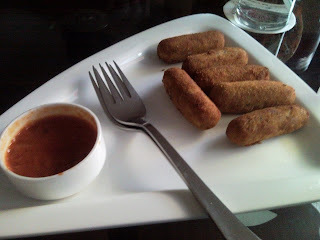 Umesh, a visitor on the blog suggested I visit the place and I must really thank him for his suggestion. When I first went to Infinitea all those years ago, they did not have much a of menu when it came to food. But this time round was really different. We decided to sit on the mezzanine floor at a comfy corner table. The tea menu was given to us separately much like a bar menu. 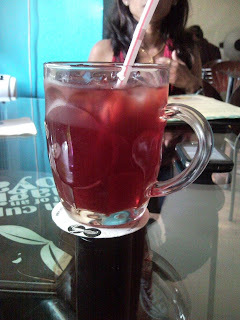 Sudhakar, a staunch coffee drinker decided to try the strong flavored pomegranate ice tea. It was really nice ice tea with a reaaallly strong flavor of pomegranate. 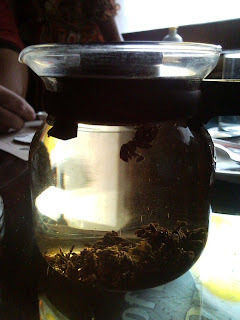 I decided to have one of the bitter teas - Enigma. 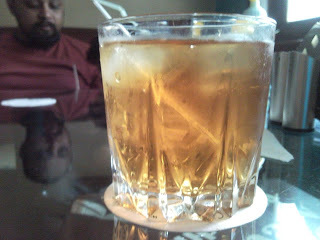 To me it looked like scotch on the rocks and was really nice to sip on. Starters was Dragon Puppets which was fritters of mashed potatoes and chicken, crumb fried and served with a tangy salsa. There was an equal proportion of mashed potatoes and chicken, which you don't really find in places that offer these kinds of dishes. 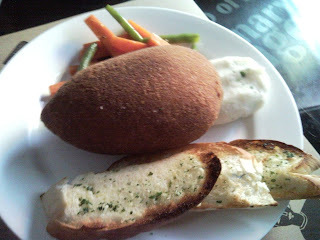 For main course, I ordered the first thing on the menu, Chicken a la Kiev. It was just too tempting to pass by. 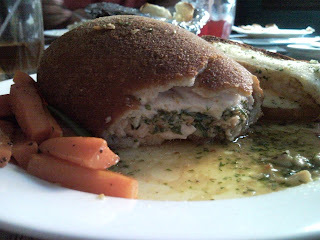 The description of garlic encased in chicken, served with mashed potatoes and garlic bread was too wonderful to let up. What came was a wonderful crumb fried case of chicken, mashed potatoes and garlic. Once the knife went through, there were rivulets of seasoned butter flowing out. The case was a little tough on the knife but overall the taste was fantastic. 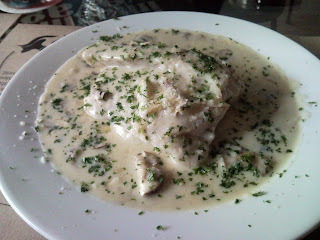 Sudhakar ordered the Pesce Florentine which was fillet of fish spread on spinach mashed potatoes and topped off with a garlic white wine sauce and baked in cheese. Absolutely and sinfully fantastic. How I managed to convince hubby dear to exchange plates in between the meal beats me. 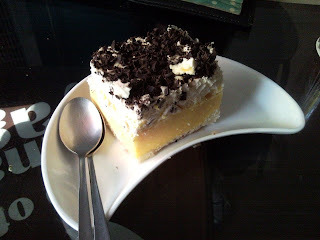 Dessert was the Italian trifle jam sponge which was custard creme topped off with chocolate shavings. I am assuming it was heavenly because junior polished it off to the last morsel. To round off the meal we decided to have a pot of Pearls of the Mountain. These are teas that are fermented and rolled into balls that unfurl when they are dropped in boiling water. The boiling water and an hour glass is brought to the table and the pearls are tipped in, in front of you. You can actually see them open up and all the color and flavor spread in the pot. Infinitea, in my opinion stands tall among all the coffee places in Bangalore. It has that little something that seems to be missing in all the places that peddle the same type of coffee under different names. Service is quick and you know the waiters are well versed with the menu when they can complete the name of your order with just one word out of your mouth. The loo is unisex and clean. The bill came to Rs 1100 which was well worth every penny.